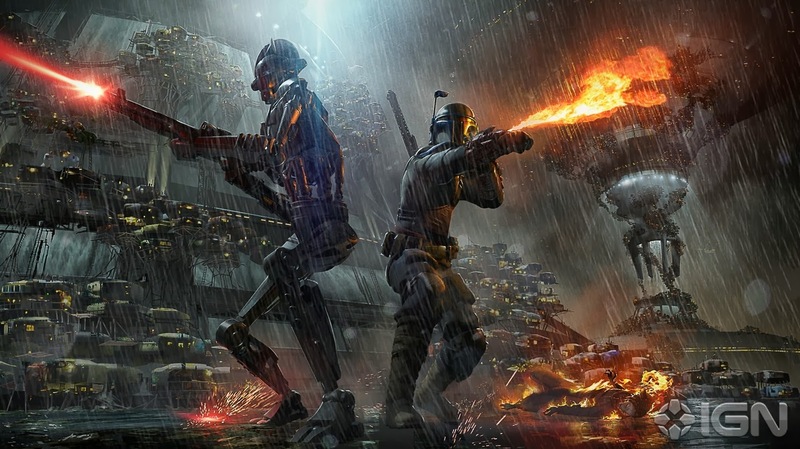 Ever since Star Wars 1313 was officially announced over a year ago the video game has been shrouded in mystery, both in and outside the Universe. With Disney's acquisition of Lucasfilm and the major downsizing of Lucasarts many have feared that we may never see 1313 completed and released. Nevertheless, IGN has now brought to light a wealth of details as well as extraordinary pieces of concept art for the game, of which you can see two from the collection above and below. While we knew from the beginning that 1313 would be set on level 1313 of the Coruscant Underworld, hence the title, details on the main characters were sketchy. Later it was revealed that Boba Fett was to be the main focus of the story, set between Revenge Of The Sith and A New Hope. IGN explains that the game's story would have actually began on Tatooine with Boba working for Jabba the Hutt and would have shown Boba develop from how we see him in the Prequel era into how he looks in the Original trilogy. Boba's companion during gameplay would have been a Droid(above) that looks exactly like C-21 Highsinger which appeared alongside Boba in Star Wars: The Clone Wars, that cannot be a coincidence. The Droid would actually end up betraying Boba in the game, supposedly. All in all it is sad not knowing the fate of this game, but at least we have this info and beautiful concept art to enjoy. I highly recommend heading over to IGN.com to get the full story as well as the images and video! Amazing. Please don't let this game be shelved forever Disney.